Kendata Peripherals, a major reseller of autofeed professional scanners, has launched a special promotion on the powerful Fujitsu fi-4530C colour A3 scanner, offering the unit in a bundle with one of the latest LG 17in. TFT monitors for just £2197 plus VAT. As well as being extremely competitively priced, the fi-4530C is one of the smallest scanners in its class, making it the ideal choice for decentralised document image capture. 225 (D) mm and, when not in use, the output tray can be folded away to keep the footprint to a minimum. Superb image quality is ensured by the scanner's optical resolution of 600dpi, and a variety of image processing functions enable the enhancement of even the poorest originals. Featuring a built-in automatic document feeder, the 4530 can achieve an impressive scan speed of 35ppm at 200dpi in colour or black and white. 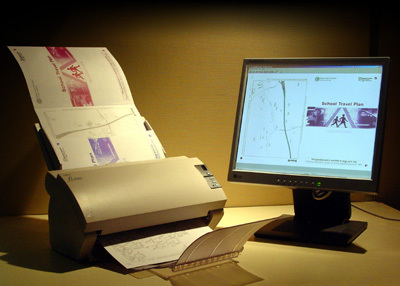 Ultrasonic double-feed detection is included as standard to prevent two or more sheets being fed through together, and a duplex scanning facility enables double-sided documents to be scanned in a single pass.Equipped with both USB 2.0 and SCSI-2 interfaces, the scanner is simple to install and comes complete with Adobe Acrobat 5.0 for easy creation of PDF files. The bundled LG 17in. TFT monitor facilitates the viewing of A3 documents and is therefore a perfect complement to the Fujitsu scanner. The scanner-and-TFT bundles are typically despatched from Kendata within three days of receipt of payment. www.kendata.com/scanners, together with details of machines from other leading manufacturers, including Kodak, Canon and Bell + Howell.